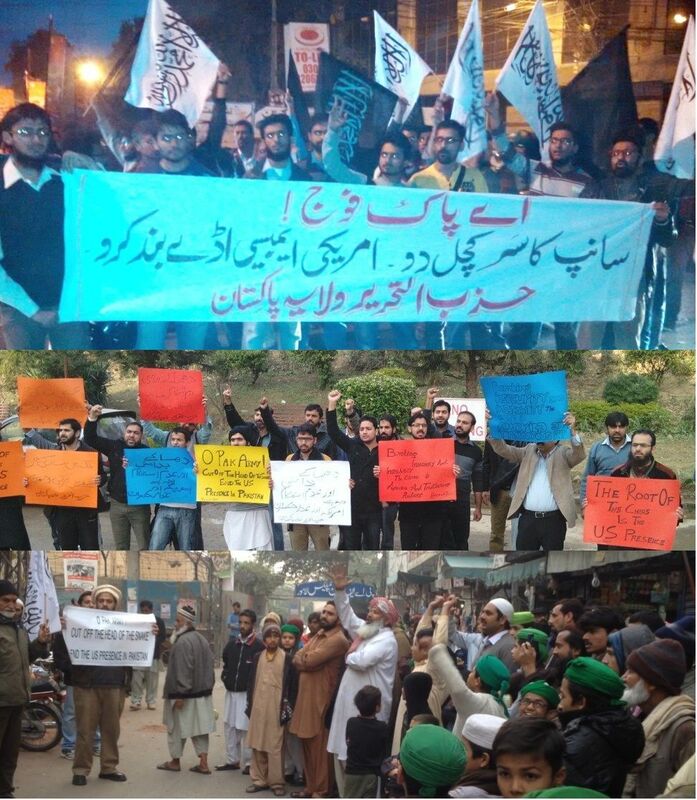 Hizb ut-Tahrir in the Wilayah of Pakistan held demonstrations across Pakistan against Peshawar massacre held on 16 December on Tuesday in which 132 children and 9 adults were brutally killed. Participants were holding placards declaring “O Pak Army! Cut Off the Head of the Snake, End the US Presence in Pakistan” and “Bombing, Insecurity and Instability, the Cause is America and Traitor Rulers”. Protesters maintained that these sort of evil attacks and massacres are conducted by US intelligence so that they can push forward their interests in the region. Brutal attacks in which innocent children are killed is the direct result of American foreign policy under which covert attacks are conducted on common people and on the army. These covert attacks are proven American tactics which are conducted by her intelligence agencies and private military organisations in order to destabilize the target country. Protestors demanded from the sincere tribal Muslims who are fighting against US occupying forces in Afghanistan that they severely condemn these attacks and purge their ranks from those who don’t know anything about Islam. Nay, they violate the commands of Allah (swt) and His Messenger (saaw) and end up assisting American plans against the Ummah. Protestors also demanded from the sincere officers of the armed forces that they must protect the lives and property of people in accordance with the commands of Allah (swt) because they have the capacity and strength and in order to achieve this objective must extend Nussrah to Hizb ut-Tahrir for the establishment of Khilafah. Then Khilafah will cut the head of US snake, close the American Embassy and Consulates, expel the enemies that roam the country to contact and spend dollars as they please, the US diplomats including its ambassador as well as the US private military and intelligence operatives. In this way, the Khilafah will cleanse Pakistan from American filth.